he sun’s fighting to break free of the cloud cover. There’s a whisker of light bathing the sea. In the distance, wind farms channel the biting ocean breeze into electrical power. There’s power of a different sort just in front of me. Where the wind farms are right-on and wonderful, as long as you don’t have to look at them, this particular low, grey presence is distinctly off message, and all the better for it. 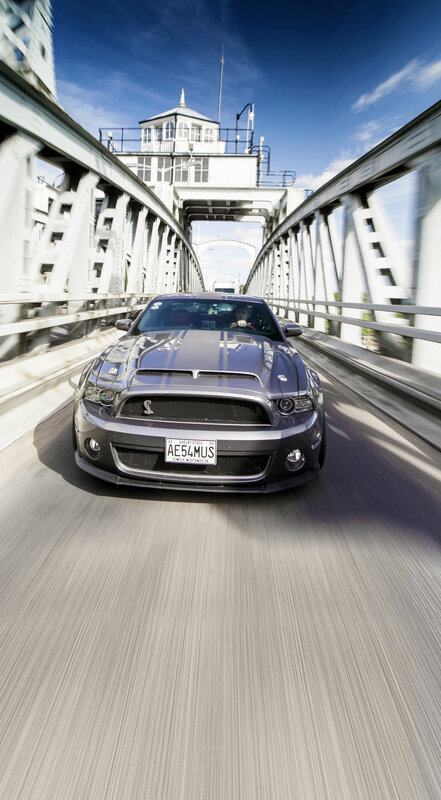 The Shelby Mustang GT500 is an all-American middle finger to European and Japanese automotive thinking. A sledgehammer to an M3’s scalpel, a crude but effective way to turn petrol into noise and tyre smoke, and surely only really suited to the Great American Highway. Well, that’s the story every copy-and-paste blogger pedals, anyway, usually just before a whinge about cabin plastics and the owners’ enthusiasm for line dancing. Think again. Far from being the big, dumb yank tank a thousand keyboard warriors claimed it would be, the latest Mustang offers dollops of rear-drive fun for a fraction of the cost of a similarly spec’d German muscle coupe. We Brits didn’t get the latest Shelby, but for the price of a new UK Mustang GT 5.0 V8 you can pick up an older Shelby Mustang, with a lot more power. But is your money better spent on that German muscle? Let’s find out. Okay, okay. Our California road trip budget didn’t quite run to flying me out to San Francisco. Instead, we begin our trip in the California that is a caravan park near Great Yarmouth on East Anglia’s furthest dip into the North Sea. Our destination is fitting for one of America’s most famous automotive sons – Boston. Not Mass. Lincs. It was Boston where a group of Protestant separatists from Scrooby in Lincolnshire sought to escape religious persecution by taking a boat to Leiden in the Netherlands. They didn’t get far – the boat’s captain betrayed them just after leaving port, and they were captured south of Boston, at Scotia Creek. The separatists were held at Boston Guildhall while they awaited trial in Lincoln. They were released, and made that trip to the Netherlands a little while later. That same congregation then formed the first colony in the New World, now known as the USA. Enough of the history lesson. Let's move on to another equally religious experience, the sound barking out of our Shelby Mustang GT500's exhaust. Few sounds stir the souls of petrolheads as readily as a V8. Some may prefer six cylinders, others adore the theatrical whinny of a hyber-boosted turbocharger’s wastegate or dump valve, but nothing turns heads quicker in a car park than the low-frequency grumble delivered by eight cylinders in a vee formation. The Shelby’s note is distinctly old-school – a baritone throb as it turns over, overlaid by busy metallic tones as the engine loudly goes about its business of being, well, an engine. And it really does do the business. Naysayers will moan that it’s nothing more special than a truck motor. While it’s true that the 4-valve Modular engine made its debut in a Lincoln Navigator rapper chariot, over time it was developed into something far more special. The first hint of naughtiness came in 2000 with the rare Mustang SVT Cobra R, which pumped out 385bhp. By 2010 Shelby and SVT had coaxed 540bhp out of this handbuilt 5.4-litre unit, with the aid of an Eaton M122H supercharger, air-to-liquid intercooler, forged aluminium pistons, forged steel crankshaft and forged conrods. The Ford GT supercar used a variant of this engine, but it had an aluminium block. The Mustang soldiered on until 2011 with an iron block and aluminium cylinder heads. You might be thinking, then, that it’s a brute to use, especially as this particular car's engine is pushing out significantly more than stock. A smaller drive pulley makes the supercharger spin faster, giving more boost. As such, this one’s churning out 600bhp, or possibly more (owner Alex Ewers has yet to dyno it). It certainly sounds brutal enough for that number. As we trundle away from the decaying relics of family awaydays gone by, the low-frequency rumble barks its orders into the morning air with all the restraint of an American army drill sergeant who’s missed his breakfast. It’s nowhere near as punishing, though. With more than 500lb-ft at your disposal, you can float through town on a pillowy-soft 2000rpm automotive mattress. The clutch, an aftermarket racing item on this car, is pretty vicious and takes some mastering, though the Tremec TR-6060 gearbox is rather more compliant. The internals were treated to anti-friction material, making shifting much smoother than any Mustang that had gone before. 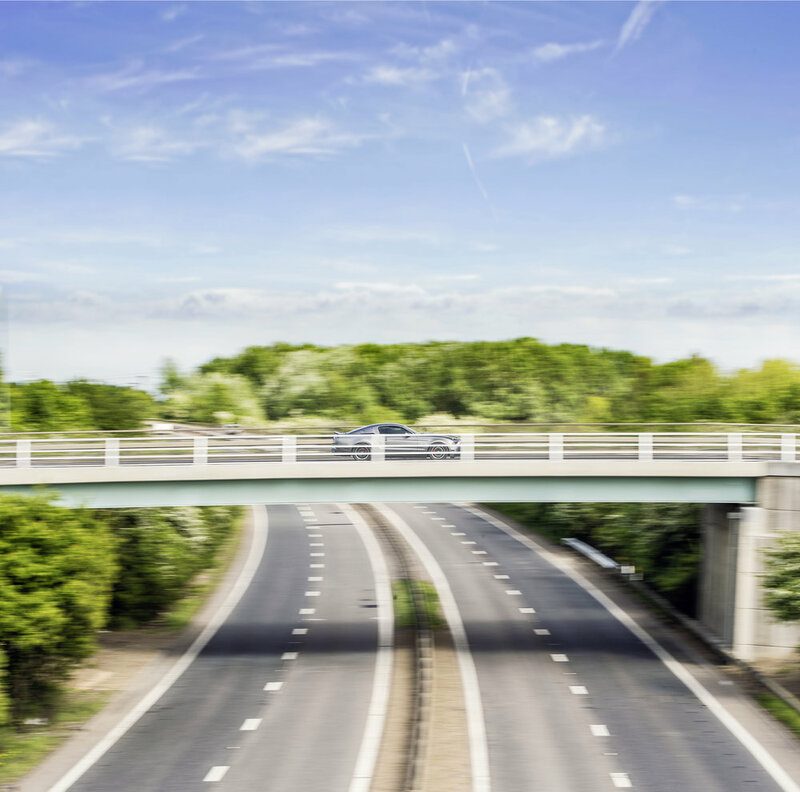 It’s a long throw, mind, and the spacing isn’t ideal for super-quick movements across the gate, but it’s perfect for motorway cruising and big-lunged overtakes. Not that there’s much chance of that in the Norfolk Broads. The picturesque villages, leafy treelines and occasional thick, forested sections bring Maine to mind, but the A-roads are too jammed to exploit the vast power reserve. Luckily, as snapper Adam clambers into the undergrowth to do some panning shots through the trees near Coltishall, there’s a chance to open the Shelby up.Instantly, the needle lurches around the dial. Past 3500rpm the supercharger screams into life, pulling the Mustang’s nose up theatrically as reality elasticises around the cabin. Plant the throttle at 40mph in third and you’ll be troubling your lawyer in around three seconds time. Clomp the accelerator from rest and you’ll batter past 60mph in a smidge under four seconds. Give it another six and you’ll pass 100. Keep giving it the beans and you’ll see 180mph, ideally not in Norfolk. Impressive figures on paper, but it doesn’t feel much quicker than a Mercedes-Benz C63 AMG, perhaps its closest European rival in terms of scope. They’re pretty well-matched, the Merc only a tenth of a second behind the Mustang’s 12.5-second quarter mile despite the AMG’s 90bhp stock deficit. It’s not down to weight, either – the Shelby is fractionally lighter than the Merc. As we leave the confines of The Broads and get onto the smooth new tarmac of the north Norwich bypass, I find I’m not caring about paper numbers. My arm naturally gravitates to the window sill as the accelerator dips hard and I’m headbutting the horizon. Other cars appear and disappear like jack-in-the-boxes as this howling, barking machine punches through the air. You won’t tire of pulling out behind a dawdler, planting the throttle and feeling your spine compress into the cowhide. But then that’s not exactly news, is it? This is what Mustangs have been great at for decades – turning the great American highway into a streaming blast of spent hydrocarbons and full-bore hilarity. Us Europeans have a tendency to find our Mustang mirth elsewhere, and not always ‘laughing with’. The usual recipient of this mockery is the rear suspension. And yes, this Mustang has a live rear axle, with three trailing arms and a Panhard rod. I can almost sense the chortles through the newsprint. Time to address this with something distinctly un-American – roundabouts. The thing is, though, for what this car is – a sports GT – you really can’t tell the difference. Turn-in is pleasingly direct (unlike the C63’s rubbery delivery) and, although there isn’t much relayed through the steering wheel, there’s enough info to place it with precision. That big iron block initially pulls the nose wide, but a little nibble of throttle will bring the nose around. Breakaway is progressive. There’s a three-stage traction control system to help you: off, launch mode (for when you have to do drag strip runs…) and on. There’s also a limited-slip differential out back. Most C63s do without. Mostly, you feel fully planted. Only on the bumpiest corners does the rear become lively, but it will telegraph this loud and clear, rather than pitching you off the road. It’s not as nimble as an M3, but it’s friendlier than a C63. An A-road machine rather than a B-road thriller. As we sweep through Dereham's gently rolling hills, the Mustang comes alive. Our 2010 car has stiffer suspension than previous Shelbys, but it’s still supple enough, and there’s very little wallow. It feels tight and accurate. Before long we're crossing the River Ouse on the A47, which calls the once great industrialised regions of north-east America to mind. The Shelby is similarly Springsteenish in its 'aggressive workman' style. Pumped wheelarches house 19in alloys and the AC Cobra 427-inspired snout bears down on road users in the same way a peeved snake might on a mouse. Talking of which, snakes are everywhere in the motifs and badging. It’s not all show, though. There’s a Gurney flap rear wing to provide extra downforce, and a subtle chin spoiler to keep the nose planted. The bonnet is aluminium. There’s a weight of quality on the inside, too. It’s another source of mirth among us Europeans that American interiors are about as inviting as a light supper with Jeffrey Dahmer. The Shelby is much better than you’d expect. It’s a mixture of the slightly silly (the cueball shift knob and the polka dot-covered facia) and the comfortable. You get a well-sized steering wheel, nicely positioned pedals and comfortable leather chairs. It certainly feels like an event behind the wheel. Your view is dominated by the swollen bonnet and its pins, which vibrate and wobble in time to the forward force of the Modular V8 and its rising heat. The sun’s been chasing us all day and snapper Adam is starting to get concerned whether we’ll have enough light in Boston. The long, open roads of the Lincolnshire fens are well-suited to high-speed runs – elongated straights, little traffic and not much on the horizon to distract you. Were it not for the fields of vegetation, there’d be an air of abandoned American desert about the place. Some of the villages cling to the road like desperate insects clamped to the side of a cactus: one-street towns with one-note economies, largely passing trade. The Shelby blasts past them all nonchalantly. We’ve been on the go all day but the Mustang is still ready, willing and able. We finally reach Boston. Alas, we couldn’t get official permission to shoot on the docks. As Adam flicks through the last of the pictures nearby, it’s time to consider the big question: would I be willing to overlook traditional German coupes for this Shelby? Against the C63, it’s no contest – the Shelby steers better and outdoes the Merc on its other redeeming features of noise and pose. It’s more characterful than an Audi RS5, too, and rides much better. But what of the M3? trip to the shops into an event. By contrast, the Shelby does what Americans have always done well, turning what could be a boring experience – oval racing, American Football, politics – into an exciting, addictive and soul-stirring adrenaline hit. Today was the proof. These roads will never be uttered in the same breath as the Route Napoleon or Stelvio Pass, but a Shelby GT500 turns the humdrum into a humdinger.